Even with great experience and expertise breeding is always a bit of gambling in the end: One can never be sure what kind of a foal will be born from a mating. Having this in mind, Ali Matar Al Wawan of Al Wawan Stud must have been extremely proud after winning both yearling championships with his youngsters Lulu Al Wawan and Aliyaar Al Wawan. 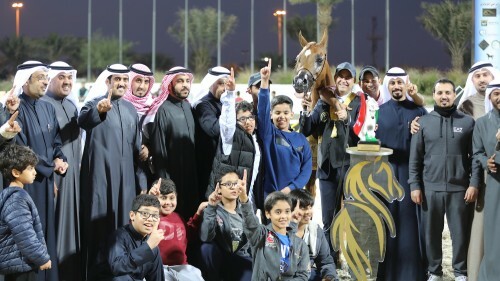 With such horses, the future feels bright for a breeder although Ali Matar Al Wawan was not the only breeder who was over the moon after the championships; however, everyone must wait his turn! The yearlings came first and it was enchanting grey SMA Magic One daughter Lulu Al Wawan out of Alia EA, by Khidar and back to Polish bred Arra, by Bandos, who accomplished Gold Champion Yearling Filly with five votes out of six. The silver medal was given to the Royal Colours daughter AB Muhra out of Hamra Music Memo. The Bronze winner, Amalia Al Mai, is sired by Sultan Al Zobara and is out of Conga O, herself linebred to influential sire Ali Jamaal. Aliyaar Al Wawan, the Unanimous Gold Champion Yearling Colt, is by Fadi Al Shaqab, an accomplished show champion himself. His dam, Abha Myra, by Marwan Al Shaqab, wowed the crowd and judges likewise at every event she competed as she captured a dazzling array of show ring titles during her brief show career. Psynecia SPA is the dam of Aliyaar Al Wawan, a direct daughter of unforgettable Padrons Psyche, who passed away last September. The judges awarded Silver to Anan Al Konooz, sired by Zeus EA (a full brother to Excalibur EA) out of the Khidar daughter Aura EA. This mare is tracing back to aforementioned Arra, too. The Bronze winner was Asayel Shaham, by PSE Al Rakhan and out of Al Mazyouna, by Sinan Al Rayyan. Mr. Abdulaziz Motlaq Al Shuraiaan is the proud owner of Gold Champion Junior Filly Sultanah Al Arja. Her sire A Jericho is an accomplished young show horse and sire in the USA, representing the sire line of Ali Jamaal through Jullyen El Jamaal. Ali Jamaal can also be found on the female side of Sultanah Al Arja’s pedigree. Her dam PA Perdita is by Ali Jamaal grandson EVG Gentry. Silver was awarded to HW Monefa, linebred to Padron Psyche through her sire AJ Fenjan as well as through her dam Ashira of Rohan. Bronze Champion Junior Filly Ghalia Al Fayyad, out of Galeona is sired by the wonderful Ekstern, a superstar in the show ring as well as in the breeding barn. The judge’s decision to award the Gold Champion Junior Colt to Nayrouz Al Mai was reached unanimously and drew a smile to the face of his dear breeder Mrs. Mai Ahmad Bu Zubar, Al Mai Stud. The sire of this bay colt Nayrouz Al Mai is Hasman GYO, himself by Ajman Moniscione and back to Padrons Psyche. The dam is Conga O, by Mazkarade, who also brought the Bronze winning yearling filly, Amalia Al Mai. 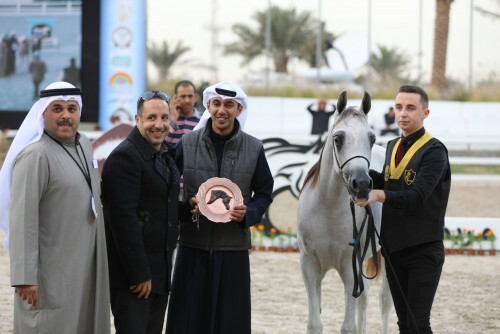 Gallardo received Silver, a son of D Jalmoud and out of Vivienne, both are grandchildren of Gazal Al Shaqab. Bronze-winning Ajab Al Rayat is again by AJ Fenjan and out of R Magnum China Doll, so linebred to Padrons Psyche. Gold Champion Senior Mare Al Areeb Shaqra is a bright chestnut just like her sire Ajman Moniscione, proudly owned by Fahed Hamad Al Enezi. Al Areeb Shaqra’s dam is Amaretto Moon LRA. In her pedigree, one can find the finest sires of the back 40 years like Aladdinn, Bask, Bey Shah and Padron. Al Wawan Stud celebrated another success with the Moutaz Al Biwaibiya daughter Lucinda Al Wawan out of Maysaa Al Khalediah. The sire Moutaz Al Biwaidiya is by 2000 Triple Crown Winner Aja Sangali, who traces back to FS Bengali – Kubinec – Balaton. Michalow bred Al Bedayah, by Hassan Ashraf out of Fragaria by Gaspar achieved Bronze Champion Senior Mare. The Senior Stallion Championship was a close decision with Asayel Al Sham winning Gold over Asayel Shamal and Sari Al Owanah. Mohammed Khuraibet’s Asayel Al Sham is by Aja Sanagor, representing the same sire line as Moutaz Al Biwaidiya: FS Bengali and back to Kubinec and Balaton. Asayel Al Sham’s dam is the Gilly J daughter Miss Sunshine J. Silver winning Asayel Shamal is also sired by an “Aja” stallion, but this time by Aja Hassan, representing the Padrons Psyche sire line through WH Justice. Aja Hassan's dam is by Kubinec. Al Mazyouna, out of Egyptian and Russian lines, is the dam of Asayel Shamal and also brought the Bronze Champion Yearling Colt. Last but not least, the Bronze winner Sari Al Owanah is sired by Alfonzo of the Padrons Psyche sire line through AB Magnum, while his dam OFW Annica is by Gazal Al Shaqab. This competition for purebred Arabian horses was showcasing their beauty, noble spirit and desert heritage. Thank you to the organizing team of the Kuwait Arabian Horse Breeders Society for arranging everything so wonderful. Arabian Horse Global Network would like to extend our thanks for the excellent collaboration.